This week, Senator Chuck Schumer (D-NY) released a discussion draft for a bill that would further limit the amount of interest an inverted corporation can deduct from its taxable income. The aim of this bill is to make it harder for inverted corporations to reduce their taxes paid to the U.S. Treasury through a procedure called “earnings stripping.” This bill would apply to all future companies that invert and companies that have inverted in the last twenty years. The proposed bill is unfair in its retroactive application, takes aim at insignificant revenue loss, and does not address the fundamental issues with the United States’ current tax code. Under current law, the United States already limits the amount of interest a corporation can deduct from its taxable income. The Section 163(j) rules were passed in the late 1980s in order to prevent U.S. corporations from using excessive interest deductions in order to reduce their taxable income in the United States and shift their income into countries with lower tax rates. The rules do not allow corporations to deduct interest from their taxable income and pay that interest to related corporate subsidiaries under two conditions: when a company has a debt-to-equity ratio greater than 1.5 to 1 or the amount of interest a company can deduct exceeds 50 percent of their taxable income. For example, a company may earn $100 in taxable income the United States. This U.S. company would only be able to deduct up to $50 in interest in the United States and pay that interest to a subsidiary in Canada. Senator Schumer’s bill alters these rules specifically for inverted companies. The law reduces the interest limit to 25 percent of taxable income. The second half of the law changes the definition of an inverted company in two ways. First, it broadens the definition of an inverted company in a way that reduces the ownership requirement from 60 percent to 50 percent. Second, it retroactively applies these new restrictions to companies that inverted after 1994. There are two issues with retroactive taxation. First, retroactive tax changes are unfair. Businesses have been operating, planning, and investing under a specific set of rules. It is not fair if they are then later told that they will be taxed on this past behavior differently. Second, it is usually thought that retroactive tax changes are efficient in so far as businesses and individuals cannot plan for them and alter their behavior. However, this only holds if there is no prospect of future retroactive tax changes. When a retroactive tax is applied, it gives the impression that the government is open to future retroactive tax changes. 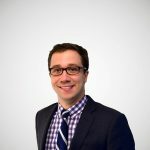 This will make businesses and individuals more cautious about future planning and can drastically cut back on future investment and economic activity. This bill is being proposed as a way to stop a significant erosion to the corporate tax base, but there is not much evidence to support that earnings stripping or inversions are a significant revenue cost. This bill will make the corporate tax code more complex and uncompetitive with little benefit. 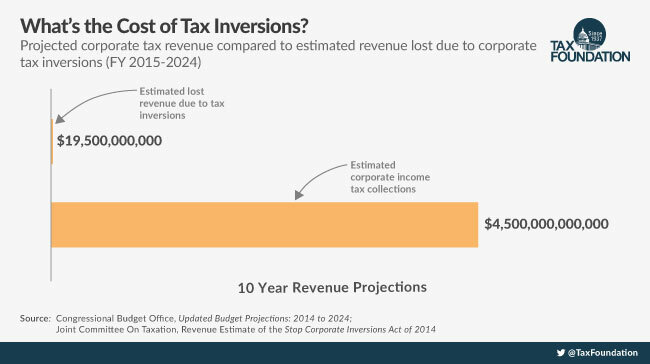 According to the Joint Committee on Taxation, inversions are projected to cost the U.S. Treasury approximately $20 billion over ten years. While this seems like a significant amount, it pales in comparison to the $4.5 trillion the CBO projects the U.S. Treasury to collect from the corporate income tax. There is also a lack of evidence that earnings stripping, specifically from foreign-owned (or inverted) corporations, is a big deal either. 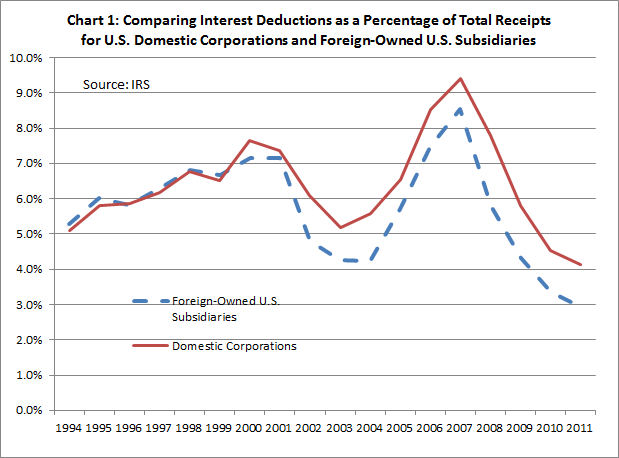 According to IRS data, foreign-owned subsidiaries (which include inverted companies) deduct less interest than domestic corporations. If earnings stripping were a big deal, foreign-owned companies, the opposite would be the case. The biggest issue with this law is that it does not address the fundamental issue with the United States’ tax code: its high corporation income tax rate and its worldwide taxation of corporate profits. For inversions, the biggest benefit is the fact that most countries do not have worldwide corporate income tax systems. Most countries have what are called territorial systems that only tax income earned in their border. This means that any profits earned inside a country are taxed by that country and any profits earned outside of a country is not taxed. So if a U.S. corporation relocates to the United Kingdom, it would no longer be liable for that additional U.S. tax on its foreign profits. For earnings stripping, any benefit comes from the fact that the United States’ corporate income tax rate is higher than every other country’s tax rate in the OECD. Take the tax differential between the United States and Canada (39.1 percent vs. 26.3 percent). A corporation has an incentive to realize income in Canada (because of its low income tax rate) and realize costs in the United States (because of its high income tax rate). Another way to look at this is that if the U.S.’s corporate tax rate was lower than other countries, there would be no incentive to strip earnings from the United States, there would actually be an incentive to move earnings into the United States. If lawmakers wanted to treat this issue seriously, they would look to lower the corporate income tax rate and move to a territorial tax system.